In a move designed to starve botnets where they live, Microsoft launched a program on Tuesday to plug its security intelligence systems into its global cloud, Azure. “All too often, computer owners, especially those who may not be using up-to-date, legitimate software and anti-malware protection, unwittingly fall victim to cybercriminals using malicious software to secretly enlist their computers into an army of infected computers known as a botnet, which can then be used by cybercriminals for a wide variety of attacks online,” Microsoft explained in a blog post. Once a network is taken down, though, its minions must be sanitized. That’s what ISPs and CERTs do with the information they receive from Project MARS (Microsoft Active Response for Security), which is now plugged into Azure. “While our clean-up efforts to date have been quite successful, this expedited form of information sharing should dramatically increase our ability to clean computers and help us keep up with the fast-paced and ever-changing cybercrime landscape,” Microsoft noted. “It also gives us another advantage: cybercriminals rely on infected computers to exponentially leverage their ability to commit their crimes, but if we’re able to take those resources away from them, they’ll have to spend time and money trying to find new victims, thereby making these criminal enterprises less lucrative and appealing in the first place,” it added. Currently, Microsoft manages hundreds of millions of events a day with its security intelligence systems. It foresees that number climbing into the ten to hundreds of billions in the future, noted T.J. Campana, director of the Microsoft Cybercrime Center. Now the only data Microsoft is putting into its intelligence systems is MARS program data. “As we increase the number of takedowns we do per year, the size of the attacks and work with more partners around the world, we’ll be processing a much larger set of IP addresses and events per day,” Campana said. Azure allows Microsoft to accommodate that expansion. “The ability to have that kind of elasticity dynamically through Azure has been a huge advantage to us,” he added. For one security analyst, the move to Azure was long overdue. “It’s something Microsoft should be proactive about because it has millions of endpoints from which to collect this information,” Gartner security analyst Avivah Litan told CSO. Ongoing attack from >90,000 computers is creating a strain on Web hosts, too. “These larger machines can cause much more damage in DDoS [distributed denial-of-service] attacks because the servers have large network connections and are capable of generating significant amounts of traffic,” Matthew Prince, CEO of content delivery network CloudFlare, wrote in a blog post describing the attacks. It’s not the first time researchers have raised the specter of a super botnet with potentially dire consequences for the Internet. In October, they revealed that highly debilitating DDoS attacks on six of the biggest US banks used compromised Web servers to flood their targets with above-average amounts of Internet traffic. The botnet came to be known as the itsoknoproblembro or Brobot, names that came from a relatively new attack tool kit some of the infected machines ran. If typical botnets used in DDoS attacks were the network equivalent of tens of thousands of garden hoses trained on a target, the Brobot machines were akin to hundreds of fire hoses. Despite their smaller number, they were nonetheless able to inflict more damage because of their bigger capacity. According to CloudFlare’s Prince, the distributed attacks are attempting to brute force the administrative portals of WordPress servers, employing the username “admin” and 1,000 or so common passwords. He said the attacks are coming from tens of thousands of unique IP addresses, an assessment that squares with the finding of more than 90,000 IP addresses hitting WordPress machines hosted by HostGator. Operators of WordPress sites can take other measures too, including installing plugins such as this one and this one, which close some of the holes most frequently exploited in these types of attacks. Beyond that, operators can sign up for a free plan from CloudFlare that automatically blocks login attempts that bear the signature of the brute-force attack. Already, HostGator has indicated that the burden of this mass attack is causing huge strains on websites, which come to a crawl or go down altogether. There are also indications that once a WordPress installation is infected it’s equipped with a backdoor so that attackers can maintain control even after the compromised administrative credentials have been changed. In some respects, the WordPress attacks resemble the mass compromise of machines running the Apache Web server, which Ars chronicled 10 days ago. With so much at stake, readers who run WordPress sites are strongly advised to lock down their servers immediately. The effort may not only protect the security of the individual site, it could help safeguard the Internet as a whole. In all, the nine-month scanning project found 420 million IPv4 addresses that responded to probes and 36 million more addresses that had one or more ports open. A large percentage of the unsecured devices bore the hallmarks of broadband modems, network routers, and other devices with embedded operating systems that typically aren’t intended to be exposed to the outside world. The researcher found a total of 1.3 billion addresses in use, including 141 million that were behind a firewall and 729 million that returned reverse domain name system records. There were no signs of life from the remaining 2.3 billion IPv4 addresses. Continually scanning almost 4 billion addresses for nine months is a big job. In true guerilla research fashion, the unknown hacker developed a small scanning program that scoured the Internet for devices that could be logged into using no account credentials at all or the usernames and passwords of either “root” or “admin.” When the program encountered unsecured devices, it installed itself on them and used them to conduct additional scans. The viral growth of the botnet allowed it to infect about 100,000 devices within a day of the program’s release. The critical mass allowed the hacker to scan the Internet quickly and cheaply. With about 4,000 clients, it could scan one port on all 3.6 billion addresses in a single day. Because the project ran 1,000 unique probes on 742 separate ports, and possibly because the binary was uninstalled each time an infected device was restarted, the hacker commandeered a total of 420,000 devices to perform the survey. In all, the botnet, which the researcher named “Carna” after the Roman goddess of physical health, collected more than 9TB worth of data. It performed 52 billion ICMP ping probes, 180 billion service probe records, and 2.8 billion SYN scan records for 660 million IPs with 71 billion ports tested. The researcher said he took precautions to prevent his program from disrupting the normal operation of the infected devices. The researcher found that his scanning program wasn’t the only unauthorized code hitching a free ride on some of the commandeered devices. Competing botnet programs such as one known as Aidra infected as many as 30,000 embedded devices including the Linux-powered Dreambox TV receiver and other devices that run on a MIPS hardware. The scanning software detected capabilities in Aidra that forced compromised devices to carry out a variety of denial-of-service attacks on targets selected by the malicious botnet operators. The changes didn’t survive reboots, however, allowing Aidra to resume control of the embedded devices once they were restarted. The scanning program was programmed to install itself on uninfected devices, so it’s possible it may have repeatedly disrupted the malicious bot software only to be foiled each time a device was rebooted. The research project almost certainly violated federal statutes prohibiting the unauthorized access of protected computers and possibly other hacking offenses. And since the unknown researcher is willing to take ethical and legal liberties in his work, it’s impossible to verify that he carried out the project in the manner described in the paper. Still, the findings closely resemble those of HD Moore, the CSO of security firm Rapid7 and chief architect of the Metasploit software framework used by hackers and penetration testers. Over a 12-month period last year, he used ethical and legal means to probe up to 18 ports of every IPv4 Internet address three or four times each day. The conclusion: there are about 1.3 billion addresses that respond to various scans, with about 500 million to 600 million of them coming from embedded devices that were never intended to be reachable on the Internet. Over three months in mid-2012, the researcher sent an astounding 4 trillion service probes, 175 billion of which were sent back and saved. In mid-December the researcher probed the top 30 ports, providing about 5 billion additional saved service probes. A detailed list of the probes sent to specific ports is here. The only way to ultimately confirm the veracity of the findings is to go through the data in precise detail, which is something fellow researchers have yet to do publicly. Moore said there were advantages and disadvantages to each of the studies. 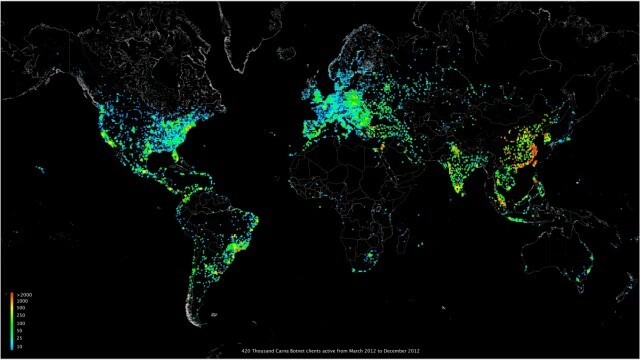 While use of an illicit botnet may have provided greater visibility into the overall Internet population, it amounted to a much briefer snapshot in time. Moore’s approach, by contrast, was more limited since it probed just 18 ports. But because it surveyed devices every day for a year, its results are less likely to reflect anomalies resulting from seasonal differences in Internet usage. Putting aside the ethical and legal concerns of taking unauthorized control of hundreds of millions of devices, the researcher builds a compelling case for taking on the project. “We would also like to mention that building and running a gigantic botnet and then watching it as it scans nothing less than the whole Internet at rates of billions of IPs per hour over and over again is really as much fun as it sounds like,” he wrote. What’s more, with the advent of IPv6, the opportunity may never come again, since the next-generation routing system offers orders of magnitude more addresses that are impossible to be scanned en masse. The researcher concluded by explaining the ultimate reason he took on the project. Hundreds of thousands of Bamital bots made ring of 18 operators over $1M a year. Users with computers infected by the Bamital botnet malware will see this page every time they click a search result. A botnet that redirected clicks from millions of PCs has been, at least for the moment, shut down by Microsoft and Symantec. Based on the fraudulent traffic generated by the Bamital botnet, the two companies estimate that its operators netted more than $1 million a year by redirecting unsuspecting computer users to websites they didn’t intend to go, cashing in on the traffic with online advertising networks. Acting on a court order they obtained from the US District Court in Alexandria, technicians from the two companies—accompanied by federal marshals—showed up at two data centers today to take down the servers controlling the Bamital botnet. A server in an ISPrime data center in Weehawken, New Jersey was seized, while the operators of a LeaseWeb data center in Manassas, Virginia voluntarily shut down a server at the company’s headquarters in the Netherlands. LeaseWeb is providing an image of that server to Microsoft and Symantec. “These servers were command and control servers, and were also absorbing the malicious traffic the botnet was creating,” said Vikram Thakur, Principal Security Response Manager at Symantec in an interview with Ars. In later variants of Bamital, the malware simply redirected any click on a search page to the botnet’s own servers, which in turn used HTML redirects to feed the victims’ traffic into an advertising network. That network acted as a clearinghouse for other advertiser networks, so a click could go through several sets of redirects before it actually landed on a website—and not the one the user expected. Because of the nature of Bamital, Microsoft is now in a position that’s different from some of its previous botnet takedowns—it has a direct line to victims of the malware. “One of things we’re doing a little differently in this case is we’re doing direct victim notification,” Boscovich said. 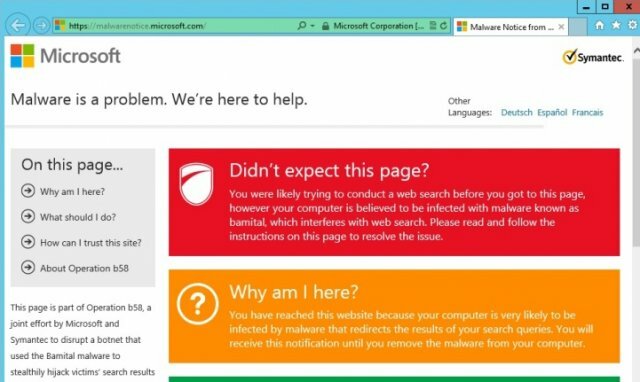 Users with systems infected by Bamital will now be redirected to a Microsoft webpage offering tools to help remove the Bamital malware—as wellas any other malware that’s out there. “There are AV signatures out there for this malware already,” Boscovich said. Thakur said that the Bamital malware was initially delivered by a combination of methods, including in packages over peer-to-peer filesharing networks disguised as other content. But the majority of systems infected were the victim of “driveby downloads” from websites configured with malicious software intended to exploit browser security flaws. “We have evidence of [the botnet operators] polluting search engine results for certain search terms with links to servers with exploits,” he said. As new variants of the botnet were developed, the operators made efforts to “upgrade” systems they had already infected. “But along the way they seemed to have left behind a number of people,” Thakur said. The older servers that had been used with previous versions of the malware appear to have been abandoned as well. In 2011, Microsoft and Symantec were able to monitor the traffic going to one of the botnet’s servers. “We got back data that showed that 3 million clicks were being hijacked by that server on a daily basis,” Thakur said. Based on a conservative estimate of a payment for one-tenth of a percent of the advertising value for each click, the companies determined the fraud ring was pulling in over $1 million a year from advertising networks. “And it could have been 2 or 3 times that much,” he said. Microsoft and Symantec are hoping the data obtained through the seizure of the server in New Jersey will help them get a better understanding of the underground ecosystem of advertising networks that drives botnets like Bamital. But it’s too early to tell if it will help catch the actual perpetrators. “We still have to go through the evidence,” Boscovich said, but he noted that Microsoft had had some success in the past in identifying botnet operators, as it did with Kelihos. Botnet was responsible for 18 billion spam messages a day — about 18 percent of the world’s spam — experts tell The New York Times. Computer-security experts took down the world’s third-largest botnet, which they say was responsible for 18 percent of the world’s spam. Command-and-control servers in Panama and the Netherlands pumping out up to 18 billion spam messages a day for the Grum botnet were taken down Tuesday, but the botnet’s architects set up new servers in Russia later in the day, according to a New York Times report. California-based security firm FireEye and U.K.-based spam-tracking service SpamHaus traced the spam back to servers in Russia and worked with local ISPs to shut down the servers, which ran networks of infected machines called botnets. The takedown of the Rustock botnet cut the volume of spam across the world by one-third, Symantec reported in March 2011. At its peak, the notorious botnet was responsible for sending out 44 billion spam messages per day, or more than 47 percent of the world’s total output, making it the leading purveyor of spam. In first three months of the year, malware circulating in cyberspace reached a four-year high and is on a pace to reach 100 million samples by year’s end, McAfee says in its quarterly threats report. “In the first quarter of 2012, we have already detected 8 million new malware samples, showing that malware authors are continuing their unrelenting development of new malware,” Vincent Weafer, senior vice president of McAfee Labs, said in a statement. “The same skills and techniques that were sharpened on the PC platform are increasingly being extended to other platforms, such as mobile and Mac,” he added. “As the authors of Zeus and SpyEye have started to be located by authorities and are starting to have issues putting out their stuff, we’re starting to see more new botnet-building SDKs [Software Development Kits] being released into the black market,” he said. Mobile malware continues to grow, McAfee reported, with more than 7,000 Android threats being collected and identified during the quarter. That’s more than a 1,200 percent increase over the previous quarter. Much of the Android infections are being spread by software distributed by third-party retailers, Wosotowsky observed. “The official Google apps store [Google Play] doesn’t have very many malicious applications on it,” he said. McAfee also reported that spam levels continue to decline. Global spam during the quarter dropped to slightly more than one trillion messages. “A lot of that is because spam is a lot more accurate nowadays than it used to be,” Wosotowsky explained. In order to prevent the botnet’s authors from updating the botnet through the peer-to-peer infrastructure, the security companies had to set up rogue botnet clients around the world and use special techniques to trick all other infected machines to only connect to servers operated by Kaspersky Lab. This is known as sinkholing, said CrowdStrike researcher Tillmann Werner during a press conference Wednesday. Once the majority of the botnet clients connected to the sinkhole servers, the researchers realized that the second Kelihos botnet was significantly larger than the one taken down in September 2011. It has almost 110,000 infected hosts compared to the first botnet’s 40,000, said Kaspersky Lab’s Marco Preuss during the same press conference. The vast majority of Kelihos-infected computers — over 90,000 — run Windows XP. Around 10,000 run Windows 7 and 5,000 run Windows 7 with Service Pack 1. Microsoft was not involved in the new takedown operation, but was informed about it, Werner said. During the September 2011 operation, the company’s role was to disable the domain names the Kelihos gang could have used to take back control of the botnet. However, this type of action was no longer necessary, because this fallback communication channel is only used by the Kelihos bots if the primary peer-to-peer-based channel is disrupted, which doesn’t happen with sinkholing, Werner said. Kaspersky will notify Internet service providers about the Internet Protocol addresses on their networks that display Kelihos activity, so that they can contact the subscribers who own the infected machines. The sinkhole will be kept operational for as long as it is necessary, Preuß said. Various signs suggest that the Kelihos gang gave up on the botnet soon after it was sinkholed. However, given that this was their fifth botnet — including the Storm and Waledac variants — they’re unlikely to give up and will most likely create a new one, Werner said. When you’re fighting against the cybercriminals behind the world’s biggest botnets, sometimes you have to get creative with your battle plans. That’s what Microsoft figured, anyways, sweeping through the offices of two hosting providers with U.S. Marshals to take down computer systems that were helping operators control the Zeus botnet from somewhere in eastern Europe. Zeus remains one of the largest botnets in existence — and one of the most lucrative, having stolen more than $100 million from its victims over the past five years. As many as 13 million computers have been infected with some variant of Zeus, and they’re all Windows machines, of course. That’s not something Microsoft wants to allow to continue, and they weren’t going to sit idly by any longer. As they did with three other botnets — Kelihos, Rustock, and Waledac — Microsoft formed a team and filed a civil suit against several John Does in order to secure permission to seize domain names and computer equipment that were connected to Zeus. Microsoft’s goal wasn’t to wipe out Zeus altogether. Not this time around, anyway. Rather, Microsoft wanted to let those operating the botnet know that they’re being watched and that operations are going to be disrupted whenever possible. The domains Microsoft seized — more than 800 in total — will now be used to monitor activity from infected computers. It’s amazing that computers can still be infected by Zeus in 2010. Microsoft added it to the Malicious Software Removal Tool way back in 2010, though constant fiddling with the original code makes it a bit more difficult to detect and uproot the many variants now floating around the Web. If everyone with a Windows computer was diligent about updating their OS and plug-ins like Java — and using a good quality anti-malware app with heuristic detection abilities — we probably could’ve relegated Zeus to the botnet scrapheap already. The reality, however, is that there are more than 350 other Zeus servers scattered around the globe and still online. Still, you’ve got to start somewhere, and at least 357 is a few less than there were last week. The new worm taking advantage of a long-fixed flaw points to the need for users to update their systems, both servers and PCs. A recent report by Microsoft found that 3.2 percent of malware was from exploits for which security updates had been available for at least a year, and another 2.4 percent were related to exploits for which an update was available for less than a year. Microsoft said today that a Czech Republic-based provider of free domains has agreed to pull the plug on botnet activities using his subdomains, as part of a settlement of a lawsuit the software giant filed in September to shut down the Kelihos botnet. The suit, filed in federal court in Virginia, named Dominique Alexander Piatti and his domain company, Dotfree Group SRO, as defendants, alleging that they were involved in hosting the Kelihos botnet. Infected computers in that operation, also known as “Waledac 2.0” after a previous botnet that Microsoft shut down last year, were used to send unregulated pharmaceutical and other spam, to harvest e-mails and passwords, to conduct fraudulent stock scams and, in some cases, to promote sites dealing with sexual exploitation of children. Subdomains also were allegedly used to spread the MacDefender scareware. “Since the Kelihos takedown, we have been in talks with Mr. Piatti and dotFREE Group s.r.o. and, after reviewing the evidence voluntarily provided by Mr. Piatti, we believe that neither he nor his business were involved in controlling the subdomains used to host the Kelihos botnet. Rather, the controllers of the Kelihos botnet leveraged the subdomain services offered by Mr. Piatti’s cz.cc domain,” Richard Domingues Boscovich, senior attorney for Microsoft’s Digital Crimes Unit, wrote in a blog post. As part of the settlement, Piatti has agreed to delete or transfer to Microsoft all the subdomains that were used to operate the botnet or for other illegitimate purposes, according to Boscovich. Piatti and his company also have agreed to work with Microsoft to prevent abuse of free subdomains and to establish a secure free top level domain going forward, he said. “By gaining control of the subdomains, we are afforded an inside look at the Kelihos botnet, giving us the opportunity to learn which unique IP addresses are infected with the botnet’s malware,” Boscovich wrote. Meanwhile, the lawsuit against the 22 other unnamed defendants is pending, Microsoft said. The Kelihos botnet comprised about 41,000 infected computers worldwide and was capable of sending 3.8 billion spam e-mails per day, according to Microsoft. Microsoft has been aggressive in moving to put botnets out of business. Kelihos is the third botnet–following Waledac, and Rustock earlier this year–that Microsoft has taken down using legal and technical measures. Instrumental in the effort that led to the seizure of Rustock’s command-and-control servers in March, Boscovich said Microsoft’s experience in takedowns of Waledac in early 2010 and of Coreflood and Rustock this year show that any botnet can be exterminated. Last week, Moscow-based Kaspersky Labs called the TDL-4 botnet “the most sophisticated threat today,” and argued that it was “practically indestructible” because of its advanced encryption and use of a public peer-to-peer (P2P) network as a fallback communications channel for the instructions issued to infected PCs. Takedowns like those of Waledac, Rustock and Coreflood have relied on seizing the primary command-and-control (C&C) servers, then somehow blocking the botnet’s compromised computers from accessing alternate C&C domains for new instructions. By doing both, takedowns decapitate the botnet, let researchers or authorities hijack the botnet, and prevent hackers from updating their malware or giving the bots new orders. That also gives users time to use antivirus software to clean their systems of the infections. Kaspersky senior malware researcher Roel Schouwenberg said that TDL-4’s use of P2P made the botnet an extremely tough nut. Boscovich disagreed, noting that the February 2010 takedown of Waledac successfully suppressed that botnet’s P2P command channel. “[Waledac] was a proof of concept that showed we are able to poison the peer-to-peer table of a botnet,” Boscovich said. Alex Lanstein, a senior engineer with FireEye who worked with Microsoft on the Rustock takedown, said that the relationships Microsoft has built with others in the security field, with Internet service providers, and with government legal agencies like the U.S. Department of Justice and law enforcement were the most important factors in its ability to take down botnets, any botnets. Those who disagree with Boscovich and Lanstein include not only Kaspersky’s Schouwenberg, but also Joe Stewart, director of malware research at Dell SecureWorks and an internationally known botnet expert. But SecureWorks also acknowledged Microsoft’s takedown chops, saying that its own statistics show that Rustock attacks have dropped tenfold since March. “Since mid-March 2011, Dell SecureWorks’ CTU [Counter Threat Unit] research team has seen a significant decline in the number of attempted Rustock attacks, and we do attribute it to the comprehensive efforts of Microsoft,” a SecureWorks spokeswoman said Tuesday. He declined to name the next likely target, saying that doing so would tip Microsoft and FireEye’s hand. More than four million PCs have been enrolled in a botnet security experts say is almost “indestructible”. The botnet, known as TDL, targets Windows PCs and is difficult to detect and shut down. Security researchers said recent botnet shutdowns had made TDL’s controllers harden it against investigation. The changes introduced in TDL-4 made it the “most sophisticated threat today,” wrote Kaspersky Labs security researchers Sergey Golovanov and Igor Soumenkov in a detailed analysis of the virus. “The owners of TDL are essentially trying to create an ‘indestructible’ botnet that is protected against attacks, competitors, and anti-virus companies,” wrote the researchers. A botnet is a network of computers that have been infected by a virus that allows a hi-tech criminal to use them remotely. Often botnet controllers steal data from victims’ PCs or use the machines to send out spam or carry out other attacks. The virus installs itself in a system file known as the master boot record. This holds the list of instructions to get a computer started and is a good place to hide because it is rarely scanned by standard anti-virus programs. The biggest proportion of victims, 28%, are in the US but significant numbers are in India (7%) and the UK (5%). Smaller numbers, 3%, are found in France, Germany and Canada. The makers of TDL-4 have cooked up their own encryption system to protect communication between those controlling the botnet. This makes it hard to do any significant analysis of traffic between hijacked PCs and the botnet’s controllers. Just over a year ago, we announced that the Microsoft Digital Crimes Unit (DCU), in cooperation with industry and academic experts, had successfully taken down the botnet Waledac in an operation known as “Operation b49”. Today, I’m happy to announce that based on the knowledge gained in that effort, we have successfully taken down a larger, more notorious and complex botnet known as Rustock. This botnet is estimated to have approximately a million infected computers operating under its control and has been known to be capable of sending billions of spam mails every day, including fake Microsoft lottery scams and offers for fake – and potentially dangerous – prescription drugs. This operation, known as Operation b107, is the second high-profile takedown in Microsoft’s joint effort between DCU, Microsoft Malware Protection Center and Trustworthy Computing – known as Project MARS (Microsoft Active Response for Security) – to disrupt botnets and begin to undo the damage the botnets have caused by helping victims regain control of their infected computers. Like the Waledac takedown, this action relied on legal and technical measures to sever the connection between the command and control structure of the botnet and the malware-infected computers operating under its control to stop the ongoing harm caused by the Rustock botnet. As you may have read, the Rustock botnet was officially taken offline yesterday, after a months-long investigation by DCU and our partners, successful pleading before the U.S. District Court for the Western District of Washington and a coordinated seizure of command and control servers in multiple hosting locations escorted by the U.S. Marshals Service. As in the legal and technical measure that enabled us to take down the Waledac botnet, Microsoft filed suit against the anonymous operators of the Rustock botnet, based in part on the abuse of Microsoft trademarks in the bot’s spam. However, Rustock’s infrastructure was much more complicated than Waledac’s, relying on hard-coded Internet Protocol addresses rather than domain names and peer-to peer command and control servers to control the botnet. To be confident that the bot could not be quickly shifted to new infrastructure, we sought and obtained a court order allowing us to work with the U.S. Marshals Service to physically capture evidence onsite and, in some cases, take the affected servers from hosting providers for analysis. Specifically, servers were seized from five hosting providers operating in seven cities in the U.S., including Kansas City, Scranton, Denver, Dallas, Chicago, Seattle, Columbus and, with help from the upstream providers, we successfully severed the IP addresses that controlled the botnet, cutting off communication and disabling it. This case and this operation are ongoing and our investigators are now inspecting the evidence gathered from the seizures to learn what we can about the botnet’s operations. Bots are versatile, limited only by the imagination of the bot-herder. That’s why Microsoft and our partners are working so aggressively on innovative approaches to quickly take out the entire infrastructure of a botnet, so that it stays inactive as we assist in cleaning the malware off of infected computers. This is how we approached the Waledac takedown and are currently approaching the Rustock takedown. We will continue to invest similar operations in the future as well in our mission to annihilate botnets and make the Internet a safer place for everyone. However, no single company or group can accomplish this lofty goal alone. It requires collaboration between industry, academic researchers, law enforcement agencies and governments worldwide. In this case, Microsoft worked with Pfizer, the network security provider FireEye and security experts at the University of Washington. All three provided declarations to the court on the dangers posed by the Rustock botnet and its impact on the Internet community. Microsoft also worked with the Dutch High Tech Crime Unit within the Netherlands Police Agency to help dismantle part of the command structure for the botnet operating outside of the United States. Additionally, Microsoft worked with CN-CERT in blocking the registration of domains in China that Rustock could have used for future command and control servers. We are also now working with Internet service providers and Community Emergency Response Teams (CERTs) around the world to help reach out to help affected computer owners clean the Rustock malware off their computers. Without multi-party public and private collaboration efforts like these, successful takedowns would not be possible. The central lesson we’ve learned from all our efforts to fight botnets has been that cooperation is the key to success. Although its behavior has fluctuated over time, Rustock has been reported to be among the world’s largest spambots, at times capable of sending 30 billion spam e-mails per day. DCU researchers watched a single Rustock-infected computer send 7,500 spam emails in just 45 minutes – a rate of 240,000 spam mails per day. Moreover, much of the spam observed coming from Rustock posed a danger to public health, advertising counterfeit or unapproved knock-off versions of pharmaceuticals. As mentioned previously, because Rustock propagated a market for these fake drugs, drug-maker Pfizer served as a declarant in this case. Pfizer’s declaration provides evidence that the kind of drugs advertised through this kind of spam can often contain wrong active ingredients, incorrect dosages or worse, due to the unsafe conditions fake pharmaceuticals are often produced in. Fake drugs are often contaminated with substances including pesticides, lead-based highway paint and floor wax, just to name a few examples. Spam is annoying and it can advertise potentially dangerous or illegal products. It is also significant as a symptom of greater threats to Internet health. Although Rustock’s primary use appears to have been to send spam, it’s important to note that a large botnet can be used for almost any cybercrime a bot-herder can dream up. Botnets are powerful and, with a simple command, can be switched from a spambot to a password thief or DDOS attacker. With your help, and the continued public and private cooperation of industry, academia and law enforcement such as Operation b107, we can stop criminals from using botnets to wreak havoc on the Internet. To follow the Microsoft Digital Crimes Unit for news and information on proactive work to combat botnets and other digital threats, visit www.facebook.com/MicrosoftDCU or twitter.com/MicrosoftDCU.